Twitter is a powerful tool for consumer-facing brands. 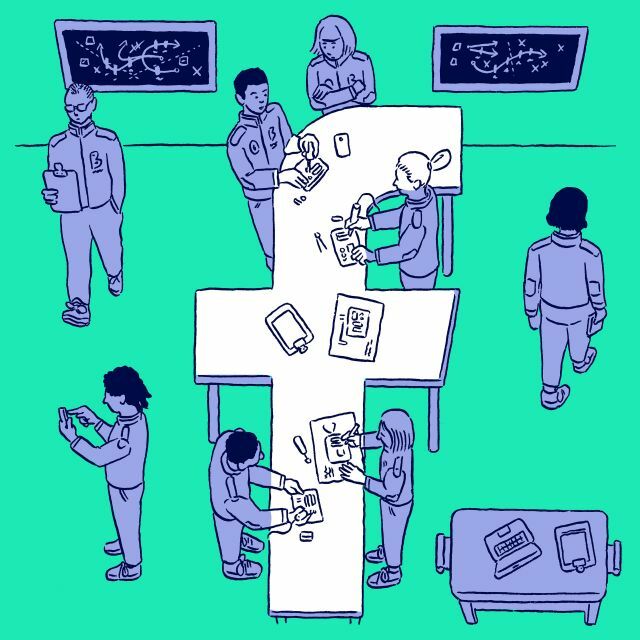 With its 328 million active monthly users, it is the second most popular social media platform with B2C marketers in North America, coming in just after Facebook. Content, however, has a short life span. If you want to get users to actually notice you, you need to cut through the noise. Video ads can be your blade in the dark. Even Twitter themselves agree that using images and video makes users three times more likely to pause and engage with your content. Interested in Facebook video, too? Learn how to make profitable campaigns in our expert-filled guide to Facebook video. Twitter video ads come in three distinct flavors: promoted video, in-stream video ads, and sponsorships. Let’s take a look at each. This is the bread and butter of video ads and it’s available to all marketers. Promo ads are a great way to raise awareness and get a particularly good video tweet in front of a larger audience. A promoted video campaign on Twitter works in much the same way as a promoted post on Facebook. Simply choose an existing tweet and promote it through your ad account. We’ll cover how to do that a bit later in the post. Trusted brands that belong to Twitter’s Amplify program upload content to the platform. That content is matched to specific, relevant, and pre-approved ads using a lot of different criteria. That way, Twitter makes sure that ads are shown alongside relevant content. On the consumer side, Twitter’s in-stream video ads have a similar feel to YouTube ads. Brands can opt for pre-roll ads before the start of a video, and mid-roll ads during the video. Brands can also chose to sponsor videos created by Twitter’s video content partners, though right now, sponsorship is available to UK and European brands. With the recent YouTube ad-pocalypse that resulted in ads being shown along unsuitable content, this is an interesting and timely opportunity for bigger brands to explore. Format: Twitter supports MP4 and MOV file formats. Length: Generally, Twitter’s maximum length is capped at 2 mins, 20 secs. Certain big brands can upload videos up to 10 minutes long. If you have a Twitter rep, you can reach out to them and ask about it, but the rest of us will have to keep it on the short side. File size: The maximum supported file size is 1GB, and the maximum frame rate is 40fps (Biteable videos are 30fps, so are safe to use). Resolution: The maximum supported resolution is 1920×1200 (Biteable videos are 1280×720, so are safe to use). How much will all this set you back? Even Twitter themselves are reluctant to share an exact price! 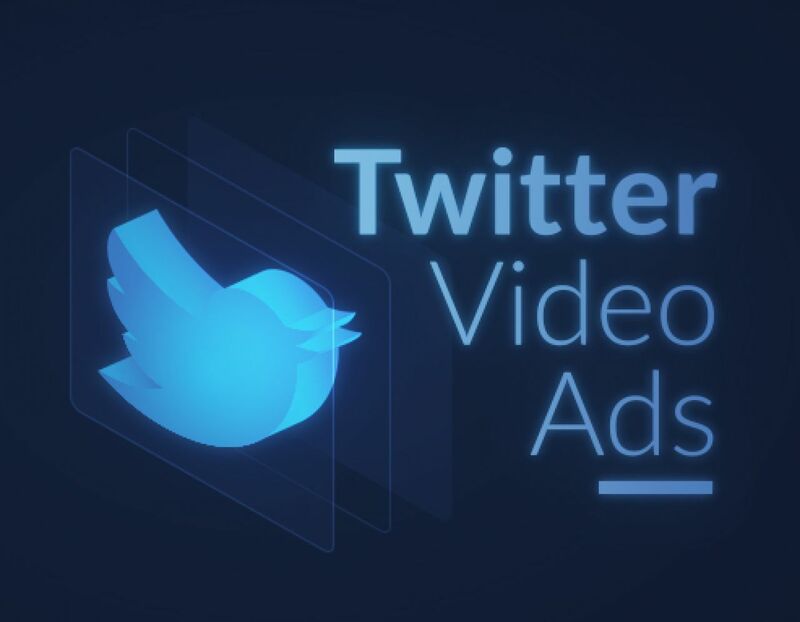 Twitter video ads are sold on a pay-per-view scale. The cost depends on a lot of factors, including your budget, your bid, the keywords you use, and your audience. The best way to get an accurate cost estimate is to set up a draft campaign. It doesn’t take much time and it will help you budget accordingly. Enough about money and file sizes. Let’s take a look at what a few different brands are doing. This video ad from Google doesn’t really tell us much about the product itself. Its purpose is to to capture your attention and make you pause long enough to notice it. The fun animation gets the message across, and it works without turning the volume up. 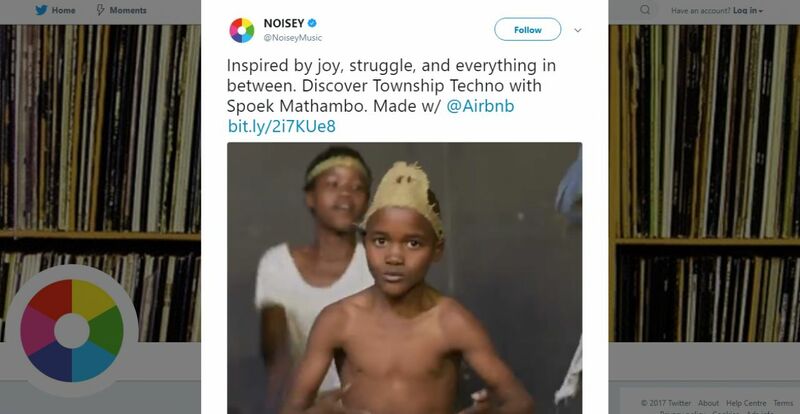 This ad from Noisey Music, created in partnership with Airbnb, is a flurry of activity. People dance across the screen while floating text explains the context in case you didn’t turn the volume up. Once the volume is on, the ad transforms into something even more powerful, with great sound and a voice over that adds depth to the story. 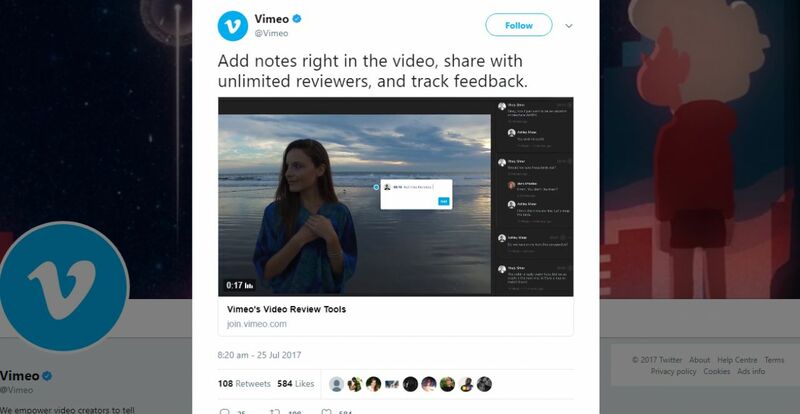 In this product ad, Vimeo introduce a brand new feature. The tweet describes the product, and the video shows it in action in under 30 seconds. The whole thing feels clean and simple. While this can be a risky approach, it can really pay off if you target the right audience. Time for the big question. 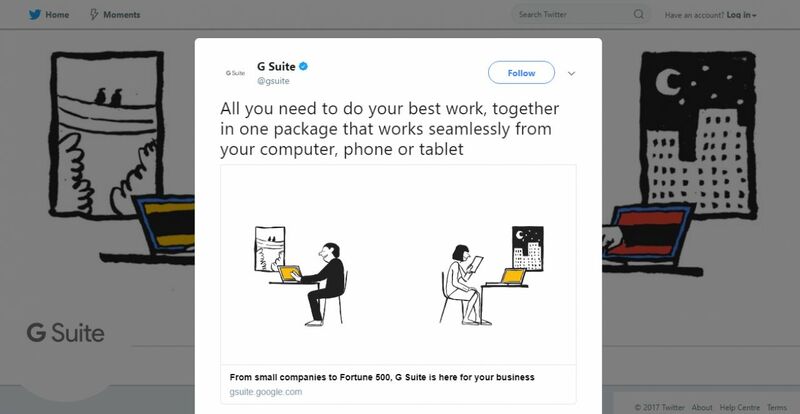 How do you create the perfect Twitter ad? Here are a few things to take into account! Twitter allows ads up to 2 mins 20 secs, but some of the best ads stick around the 30 - 60 second mark. Think about it. Watching an ad on Twitter is an interruptive experience. The user is scrolling through, looking for a short distraction, and won’t always want to hang around. Give your video its best chance of going viral by providing value straight out of the gate by making it shareworthy. Use the 280 characters at your disposal to tease and set up the ad. Relevant hashtags will make your ad feel like a normal tweet. Most of us may hesitate a second before we share an ad, so make it feel as natural as possible! Plus, hashtags add meaning and help searchability. A call to action is your battle cry. Make it powerful, convincing and easy to do. Don’t be scared to experiment. Play around with colors, text blocks, and even voice over — just make sure your audio isn’t essential, because you’ve no control over whether someone turns their sound on or not. Unlike in-stream and sponsored ads, promoted video ads are affordable, effective, and easy to set up. Let’s take a quick, step-by-step look at the setup process. 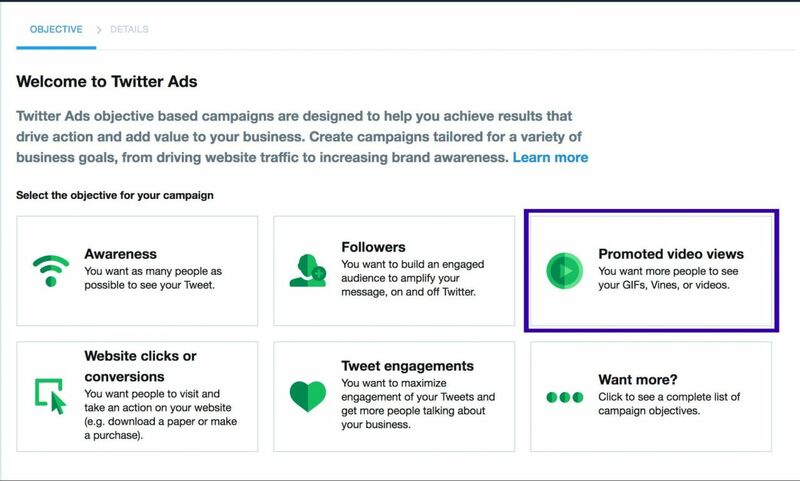 I’m going to walk you through the setup for a Promoted video views ad, but the process is fairly similar for all Twitter ads. Once inside, select Promoted video views. 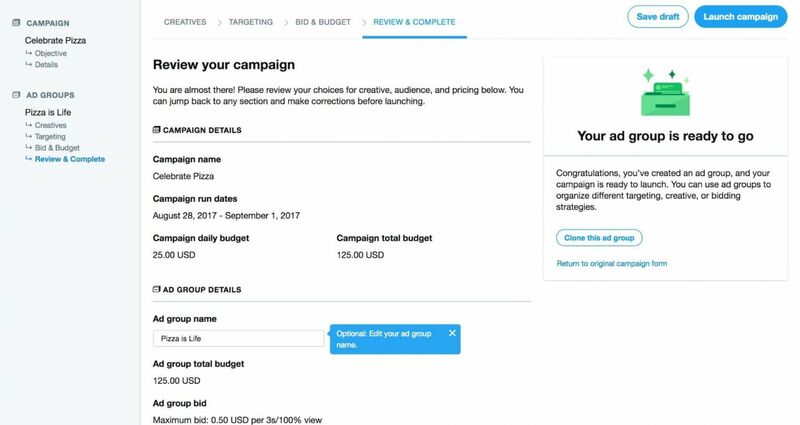 Give your campaign a name and set a daily budget. You can also set a total budget. This is recommended, as it will keep you from accidentally overspending. Next, set the start and end dates for your campaign. Pick the tweet you’d like to promote. If you’d like to promote a tweet you haven’t published yet, simply log into your account, create the tweet, add the video, and post it. You can only promote an existing tweet! You can get super-specific with the Locations, devices, and platforms section. Use your in-depth audience research to create a strong, targeted campaign. 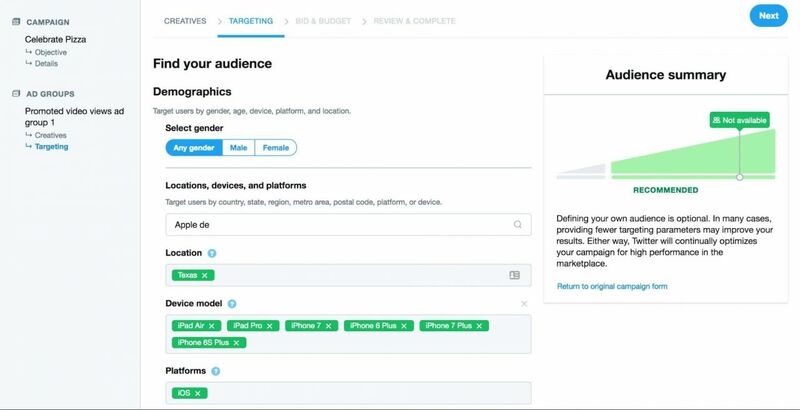 Under Audience features, you can customize your audience even further, based on keywords and behaviours. You can even build lookalike audiences that mirror those of brands that attract the same kind of people you’re trying to reach! Finally, it’s time to set your budget and chose your bid! You’ve got two options. You can set an automatic bid. If you go down that route, Twitter will automatically go with the lowest price that still meets your objectives. Conversely, you can set a maximum bid using Twitter’s recommended bid range as a guide. You can also choose how you define a view. You’ve got two options: a traditional view means that the video played for 2+ seconds while at least 50% of it was on screen. Or it can be when the user watches 3+ seconds of a video that’s 100% on the screen. All you’ve got left to do is review the campaign and hit the launch button when you’re satisfied! Launching your first campaign can be nerve-wracking! Set clear targets, tie the campaign into your overall marketing goals, and measure key metrics. Good luck! And, if you’re looking for great video creation software, check out Biteable. Our free templates come in all shapes and sizes, making it easy to put together the perfect video for your unique audience.